This one seems like it shouldn’t be true. However, it turns out, a typical domestic cat’s terminal velocity is sufficiently low, around 60 mph, that they can absorb the shock of the landing. This isn’t to say they will absorb the shock without injury; simply that they are more likely to survive the fall than not. Specifically, according to a study done by the Journal of the American Veterinary Medical Association, 132 cats falling from an average of 5.5 stories and as high as 32 stories, the latter of which is more than enough for them to reach their terminal velocity, have a survival rate of about 90%, assuming they are brought in to treat their various injuries that may occur because of the impact with the ground. Of those 132 cats included in the study, about 2/3 required some sort of medical treatment as a result of their fall, and about half of those that required treatment (1/3 of the total cats brought in) would have died without medical aid. Now, it should be noted, unlike what many reports based on this study state, this DOES NOT imply that cats falling from any height should have a 90% survival rate given proper medical attention. The average height was only 5.5 stories, which is insufficient for the cats to reach their terminal velocity. Second, the cats that die on impact are obviously unlikely to be brought into the veterinarian clinic, skewing the sample size. On the flip side of that, the cats that are uninjured (there are instances of cats falling from as high as 26 stories without any injury) also are not all going to be brought in. How much these factors would affect that “90%” rate isn’t clear. 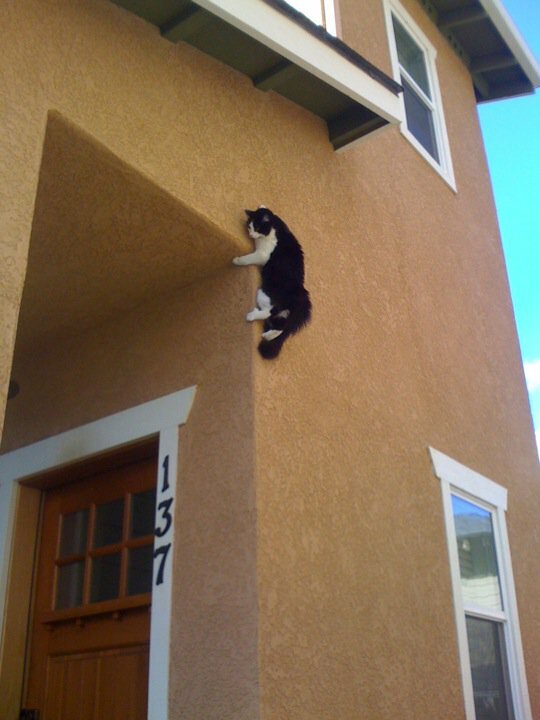 Thus, one cannot say definitively that domestic cats should have a 90% survival rate from a fall from any height. However, this study did present a reasonable enough sample size (132 cats) that the actual number shouldn’t be drastically different than the stated rate. So while we can’t say “90% survival rate”, at least we can say they have an extremely good survival rate. Now, if you think that’s strange. Here’s something even weirder. The number of injuries a domestic cat has from a long fall actually seems to go down above a certain height, specifically above about seven stories tall. There are two prevalent theories as to why this is the case. The first, presented by the veterinarians who did this study, is that cats will tend to tense up and arch their backs while they are accelerating, similar to how they look when they are feeling threatened. While this form is great for absorbing short falls, it turns out to be a poor choice for a high velocity impact. Specifically, in these high velocity impacts, being tense like that will drastically increase the cat’s injury rate. In addition to this, this form will increase the cat’s velocity around 15 or so miles per hour over the estimated average terminal velocity for cats. Once the cats reach their terminal velocity though, it’s theorized that they relax and assume a more spread-eagle, “flying squirrel”, stance, which in turn reduces their over-all velocity; puts them in a more relaxed body state; and gives a larger surface area to absorb the impact. While the study offers no direct visual proof of this happening, the types and locations of injuries seen from the cats that would have reached their terminal velocity seem to back up this idea. An alternative theory is that cats above this height simply die more often or have much more serious injuries and so aren’t brought into the veterinarian clinic at all. This seems likely enough. But it should be noted that the average number of injuries of the cats brought in having fallen from 7-32 stories is still less than the average number of injuries, per cat, brought in having fallen under that height. So while it’s plausible enough that cats falling above this height would die more, having not yet reached their terminal velocity at 7 stories, that still doesn’t explain why the average number of injuries on the cats that were brought in were less. Cats at around 7 stories should reach a velocity of around 40-45 mph, assuming around 10 feet per story, which is about 15-20 mph off their terminal velocity. Interestingly though, they should reach their terminal velocity at around 12-13 stories. In this study, there were numerous cats that survived falls as high as 32 stories and there have been recorded instances of cats falling from as high as 26 stories, that walk away with no injuries at all, which means those cats could have been dropped from 5000 feet and still have been fine, assuming they landed in the same spot and position. It should also be noted that the vast majority of the cats brought in likely landed on cement. So it is theorized that the injury rate and severity of injury would go down a bit had they landed on grass covered ground or the like. While there have been instances of cats falling from as high as 26 stories and landing on solid ground, without injury, the actual known record holder is a cat that fell from 46 stories without injury. However, this cat didn’t land directly on the ground, but rather landed on a canopy, then bounced off it and landed safely. Do Cats Always Land On Their Feet Unharmed? How Does a Cat Always Land On Its Feet? This was probably the result of stimulus funding in part to study cat survival statistics and in part to reduce the feral cat population. omg! i cannot imagine how they conducted the study! how did they make the cat jump! They didn’t make any cats jump. They studied medical records of cats that had been brought to the clinic after falling multiple stories. Obviously the cat in the video was dropped, but only about 4 feet, which for a cat is nothing. When my cat was young she would to jump from 5 or 6 feet all the time. That link should read (as the Wikipedia article does) “Cat RIGHTING Reflex.” Isn’t anyone literate left? There was an evil German scientist, long ago, who dropped cats from various heights to see what happened. I haven’t heard of the experiment being repeated, only statistical analyses like this one. Well, ours has just fallen off a 2nd storey balcony – could shoot myself for not noticing what she was up to. Just back from the vet who said that, basically, she looks ok but to give it a week to see what may or may not develop. Dominic, she should be fine, my sister’s fell off a 3rd floor balcony and survived fine, and that was like 10 years ago, and she’s still giving us terrors! Poor kitty though, I bet she was in for a fright. My sister’s kitten recently fell 5 stories from her balcony! I found it traumatizing to hear about the free fall. Fortunately, the little kitty is going to be fine, although she has sadly lost the sight in one eye, and has a broken femur. Poor kitty, what a fright! I told my sister that she may get a visit from the ‘kitty protective services’! The kitten is currently racing around the apartment, like nothing happened. I am surprised at the survival rate noted in the article, interesting good news. I am extremely skeptical of the idea that a cat will likely survive a fall “from any height” – even with the limit on terminal velocity. I’ve heard the cat survival study before, and while I’m glad you at least mention the fact that there’s no data on cats who died from large falls, I don’t think you put enough importance on that fact. Having a large sample size only gives us the likelihood of the cats surviving if they were alive enough to take to the vet. It gives no data – absolutely NONE – on the likelihood of cats surviving a fall in the first place. Those 132 cats could be from a set of 132, 133, 264, 1320, or even 132,000 cats who fell from high places – so the survival rate could be anywhere from 100% to less than 1 in a thousand. Speculating on why cats manage to survive such falls may give a model for how it was possible for ANY cat to survive a fall from so many stories high, but it doesn’t give the kind of model that says “Ah, most cats will survive because they do such-and-such.” Trying to make it sound like they’ve got magic anti-falling powers that kick in at terminal velocity is almost as silly as claiming that terminal velocity makes them spontaneously develop wings. 1. Splayed out to their sides so the joints and muscles connecting them to their body acts as a natural suspension. 2. Are already very spring like and muscular. You’ve seen cats jump before, right? Cats are also very light relative to the amount of space they take up, which means they have a large amount of surface area to keep them slow, and are fairly less dense than most other domestic animals. Put all this together and you get an animal that, in nature, is built to survive falls from extremely high up due to their ability to fall unusually slow, and distribute and mitigate the impact from this already slow fall. He wasn’t commenting on the physics – which, in any case, is entirely speculative. He was commenting on the lack of evidence backing up the idea that x% of cats survive a fall. Since we have no way of knowing how many were in the total population we have no information about this. The only useful information we have is the pattern of injuries. Did you just say physics is speculative? They can analyze the data statistically. You can work out a reasonable estimation of survivability as a function of height (perhaps by examining similar situations with small dogs). You can work out a reasonable estimation of distribution of heights of cat falls. You can work out a reasonable estimation of severity of injuries sustained by a cat that survives a fall as a function of height. If observed data differs dramatically from these models, then you examine the pattern of variance. In this case, the pattern indicated higher than expected survival and lower than expected severity. This would indicate there is something about cats that increases survivability of falls, particularly falls from greater height. I think another “study” should be conducted to see how far those who conducted this “study” can fall without resulting in death. Maybe it will prevent those sick freaks from doing a study on how long cats can survive in a microwave oven. Cats have accidental falls all the time. This is what was studied. NO ONE was throwing cats off of high rise buildings. In middle ages it happened a lot. Wonders of nature. I observed a Cat fall from 3 storied building landing safely. I’d like to know how a company got away with chucking 132 cats from heights ranging up to 32 storeys and didn’t get collared for animal cruelty. I’m with Tln maybe they should be chucked off numerous storeys to see how far they can survive a fall from. As previously stated by another commentor, they didn’t actually “chuck” any cats from any height. They simply reviewed records from veterinarians to get their pool of subjects. That is why there is a rather large issue with the rate of survival, since there is no way to find out how many cats actually were not brought in to veterinary clinics because they died on impact or shortly after from severe injuries. Not all scientists are bad guys that deserve punishment for their studies, especially when they went about gathering their data in a way to not harm the animals they were studying. so if i drop a catof a plane he’s fine? This is a very interesting study, I only looked it up after a kitten we have claimed atop a 30 ft tree and nearly fell, and was astounded to find that they are so resilient to falls. I won’t worry so much now. I can relate to this from personal experience. My cat recently fell off from the 5th floor, onto dirt. Surprisingly, it seems to be perfectly ok, still playful as ever. Except standing out the window, she is terrified of that now. A cat at terminal velocity impacting a flat hard surface – no matter what position, posture, relaxed, tense – is a terminal event for the cat. I’ve had the horrible experience of direct witness as a wonderful young Gib we’d just adopted lept for a bird off our 27th floor lanai to a parking lot below. He had agonal vitals when we got to him in about 3 minutes. Tail twitched & gone. Great article, now if you could rewrite it using real unit of measurement I would read through instead of trying to understand what 60 morph means. My cat recently fell from the 4th Story, when we were not at home. We got the news and searched all possible areas where he could have fell, but he was not found. It’s been 5 hours he hasn’t returned home. We are worried if he is injured, he ran away somewhere or died. What should we do now? Two days ago our cat fell seven stories onto a concrete driveway at 11:00 at night. Here come the thankfullys: Thankfully when we couldn’t find him on our balcony or in the house, my husband went out and looked hard for him, finally finding him cowering in a flower box. Thankfully the cat didn’t run (although ragdolls are well known for their docility). And thankfully he only lost a claw and a cut lip. This article makes it clear that he might not have lived had we lived on a lower floor. I wanted to know because this was how my cat died. Thank you. You almost leave out a critical factor, barely mentioning it at the end. The softness of the ground they land on. Hitting the ground is basically a reverse acceleration over a split time that depends on the type of ground. The energy from the fall has to be dissipated. The more of it goes in the ground the less the cat has to absorb. A trampoline progressively absorbs the falling trampolinist energy as it sags down until the energy is all absorbed at which point the speed is zero. Energy is the multiplication of a force by a displacement. For every millimeter the ground deform itself it absorbs energy that the cat does not have to. The difference of even a few millimeters makes a huge difference. Cement without doubt is the worst as it will rebound all the energy backward into the body. My Kitten keeps standing by the edge of the balcony upstairs it’s about a 20-foot drop it gets me worried is there any way I can get her to stop? A huge factor in the survivability of the cat will be how heavy the cat is. A fat 12 kg house cat will die in a fall which a scrawny 3 kg alley cat survives easily. I just accidentally pushed my cat off of my bunk bed that is about 6 feet tall and he didn’t land on his feet. Will he be ok? I am worried. We have hard wood floors so it was not a soft landing. My cat Doodle fell off the roof – 4 stories – onto gravel driveway. Finally found him hiding behind a tree. Took to emergency vet – but in too much pain to do full exam – wanted to sedate him and do $1000 of test. I asked tech ‘what’s your intuition?’ – she said he looks ok – so took him home for monitoring with pain meds – watch for respiratory difficulties, appetite, movement, hiding, elimination – all have gotten better. Now over 48 hours later – he’s eating, jumping on his perch, not complaining when touched, even purring. So guessing worst is over. Still important to watch them for days after fall, as complications can arise late. Best indicator is breathing, appetite and movement. Always take to vet after a long fall but don’t always have to do the expensive tests.